That’s how Veterans’ Affairs Minister Dan Tehan this week described the 14-hour bloodbath that became known as the Battle of Fromelles 100 years ago. Nearly 2000 Australian soldiers died and nearly 3000 were wounded in one day. One of them was 38-year-old Indigenous digger, Albert Charles Leane. It will probably never be known how many Indigenous Australians have served in the Australian defence forces. At the time of the First World War, Aboriginal people were not even entitled to vote. 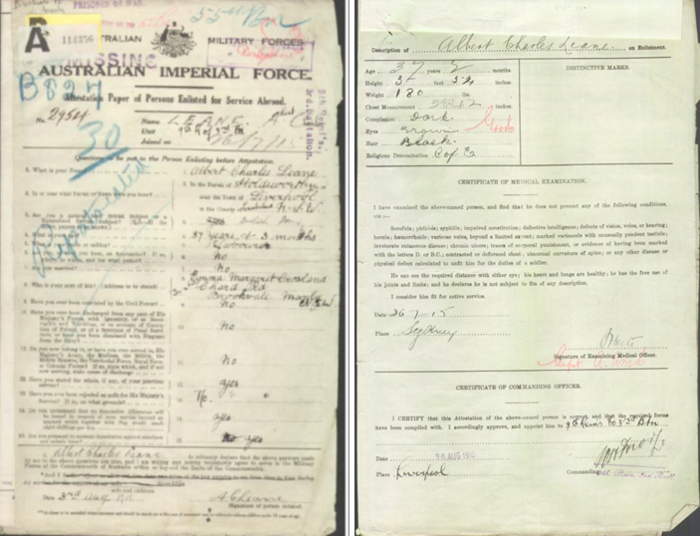 Those who enlisted were not required to declare their ethnicity and even today, ticking the “Aboriginal or Torres Strait Islander” box is voluntary. Albert Leane, who was born in 1877 in Holsworthy, New South Wales, had signed up at the age of 37 the year before the battle. He had sailed from Sydney to Egypt to join the 55th Battalion and then shipped out to the Western Front. On July 19, the full horror of war erupted at Fromelles and as German machine gunners strafed the battlefield Albert was wounded in the legs. He was captured by the Germans and became a prisoner of war, first at Stendal in Germany and then at Wittenberg. 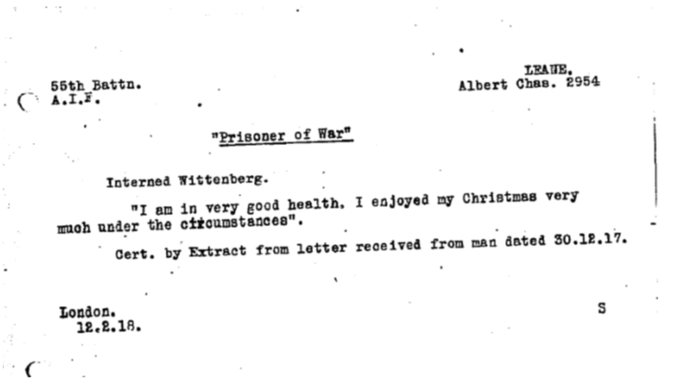 He wrote several letters to his family from the PoW camps. In two of them, which are with the Australian Red Cross Society and on his service file, he reassures his loved ones by saying he’s doing well “under the circumstances”. When the war ended he was released and shipped to England in December 1918, returning to Australia the following March. At the Centennial Memorial Ceremony held at Fromelles earlier this week, Mr Tehan said 16,900 Australians remain unaccounted for from the fighting on the Western Front. “The industrial scale of the killing, the machines and weapons that swept away life created limited time for recognition, recovery or even burial,” he said. “The grief and uncertainty of families with no plots for their loved ones was immense, pieces of their lives could never be fully recovered. Mr Tehan thanked the French people and particularly the people of Fromelles for the respect they continued to show to the Australian fallen. 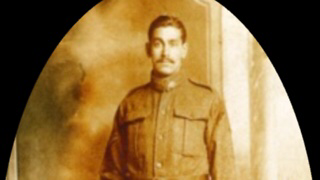 The AWM have at present approximately 1000 names of Aboriginal Australians who fought in the First World War. Many who tried to enlist were rejected on the grounds of race but this did not deter them changing their nationalities, names and places of origin in attempts to enlist. Note: NITV wishes to thank Aunt Judith Joyce Niece of Albert, who provided the photos and information used for this article. Aunt Judy is a Darug women, who wishes to Acknowledge and pay respect to her elders both past and present. She also would like to thank Philippa Scarlett and Rebecca Batemen for all the research they have done into her family’s history. Paradoksalne jest to Å¼e z zapiskÃ³w wynika Å¼e dawni muzuÅ‚manie i poganie germaÅ„scy szanowali siÄ™ o wiele bardziej niÅ¼ dziÅ› muzuÅ‚manie szanujÄ… siÄ™ z chrzeÅ›cijanami.